The Minutemen were the American colonial militia, farmer-soldiers who trained in military skills in anticipation of Indian attacks and, later, resistance to tighter control from London. Every New England colonial town had its corps of Minutemen: farmer-soldiers who could muster at a minute's notice to protect their farms, families and towns from the depredations of marauding Indians. In the 1770s, when the spirit of independence was growing in the colonies, the Minutemen found a new role: as the first line of resistance to continued British rule and, eventually, as the heart of the new revolutionary army to be commanded by General George Washington. 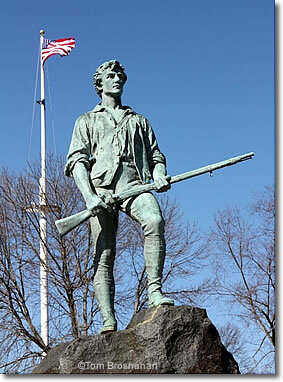 The Minutemen came into their own at the battles of Lexington and Concord on April 19, 1775, a date now commemorated in Massachusetts and Maine as Patriots' Day. When 700 British Redcoats marched up to Lexington Green at dawn on that morning, the Lexington Minutemen were there to meet them. After that first battle, the Redcoats marched on to Concord, where they confronted a superior force of Minutemen from Concord, Lexington, Acton, Bedford and other nearby towns. The battle at Concord's North Bridge was the first American victory in the war, and a rallying cry for the battles to come.